Sometimes when I sit down to write a perfume review, more interesting things pop into my mind (and that's a relief; I often feel perfumed-out these days). As I looked at my fragrance sample of Zoologist Rhinoceros, my mind went back to 2013 when I read the New York Times obituary of a woman unknown to me: Anna Merz. After reading the obit, I felt happy and energized, and I shared the article with friends, including Robin here at NST. Anna Merz was born in England but spent most of her life in Africa, first in Ghana and then in Kenya and South Africa. She was a successful businesswoman in Ghana and got involved in wildlife conservation, working with antelopes, monkeys, chimpanzees — and an Akun eagle owl named Heavenly Horus, who she described as one of the four "outstanding personalities" in her life (Samia, a rhino, was another, along with a chimp and one of her dogs who saved her life three times in Africa). When Merz moved to Kenya to retire in 1976, her life changed. She noticed the disappearance and slaughter of rhinos all around her and decided to use her own money (over a million dollars) to create a sanctuary for black rhinos. 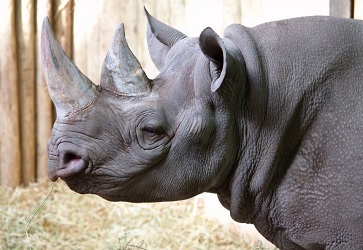 Rhinos are killed for their horns, an expensive and rare commodity. The horns have been used as dagger handles in Yemen, and currently in Vietnam as everything from "cancer cures" to aphrodisiacs, party 'drugs' (powdered and sniffed like cocaine) and status symbols ("I'm rich enough to afford rhino horn.") Internationally, the trade in rhino horn is banned under CITES (Convention on International Trade in Endangered Species of Fauna and Flora) but the crazed slaughter of rhinos continues (even rhinos in zoos and art objects made of rhino horn in museums are targeted). The sanctuary Merz helped found, now called the Lewa Wildlife Conservancy, has been successful in protecting its rhinos and in facilitating breeding; thanks in part to Lewa, the black rhino population has doubled since 2003. This spring I bought and read Merz's book Rhino: At the Brink of Extinction and was thrilled it was an autographed copy (presented to a donor). The book is full of inspiring, sad (I cried), scary and hilarious stories. The abandoned baby rhino calf Merz raised by hand and lived with for 11 years (Samia) would often join Merz on walks and, as a baby, in bed. One night, Merz was home alone, soaking the day's dirt and cares away in the bathtub. When she heard doors creak and a light step approaching the bathroom, Merz yelled out in fear: "WHO IS THAT?!" In walked Samia, who had broken a barricade, unlatched a gate, and opened doors to reach her friend. Merz had to jump from the tub where Samia was about to join her. On another memorable occasion, Samia became jammed in a doorway inside the house and Merz could only dislodge her by pouring cooking oil over the huge animal and giving her a BIG shove. 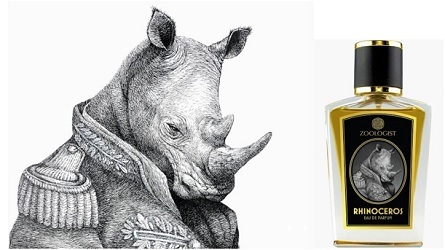 Into this story comes Zoologist Rhinoceros Eau de Parfum (60 ml/$135). Rhinoceros includes quite the mix of notes: rum, bergamot, elemi, immortelle, lavender, geranium, sage, armoise, "conifer needles," pinewood, cedar wood, tobacco, agarwood, vetiver, amber, sandalwood, smoke, leather and musks; it was developed by perfumer Paul Kiler of PK Perfumes. Rhinoceros goes on as a musky/smoky leather scent (with a brief shot of rum and dense citrus). Next up are herbal notes (sage, immortelle and geranium) that are joined by resinous aromas —sweet "turpentine," fresh-cut pine. The perfume ends with the scents of leather, caramelized amber, oud and smoked nougat. Rhinos love to forage in the dry lands they occupy, digging up roots, turning over logs to eat insects, munching on all types of grasses and shrubs and pulling down low tree branches with their horns. I'd describe Rhinoceros as a "civilized" rhino encounter (nice boots, leather seats in the Range Rover). What we're missing are indoles — representing the massive quantities of rhino merde and urine (more pine could have solved this one) they use to mark territory. I'd be afraid to wear any perfume on a trip through an African sanctuary...imagine those wild critics!...but if you'd like to imagine Kenya (and its colonists) a hundred years ago, Rhinoceros may appeal. I enjoy wearing it and will use it more often in cool weather. I can't imagine Anna Merz wearing perfume; her lack of vanity is laudable (in one episode in her book she laughs about losing her glasses AND her dentures as she flees from a wild rhino she encounters accidentally). Merz's New York Times obituary includes these lines: "She left no immediate survivors but more than 70 black rhinos, including one born the day she died." Further reading: Rhino horn facts. * All quotes in this post, unless otherwise noted, are from Rhino: At the Brink of Extinction by Anna Merz, HarperCollins Publishers, 1991. Note: top image is Noble profile [cropped] by Paul Albertella at flickr; some rights reserved. Nice review. I doubt I’ll smell the perfume but will definitely search out and read the book. What a perfectly lovely story, especially about the the rhino wanting to join her in the bath. austenfan: the telling of that one made me laugh out loud…and want a rhino. Thank you Kevin for sharing the story of this incredible woman and her incredible rhinos. I had never heard of her, but I am glad I did just now! Jiji: and they do offer great ways to sample the line, too. I’ve liked several so far. That is a beautiful quote about giving, a good thought for today and everyday. When reading Merz’ description of her reunion with Morani I like to think that he approached because he knew it was her by her smell, and that he pressed his nose to her face so that he could smell her better and in turn share his scent and breath with his old friend. Such a beautiful moment. Thank you for the review, if ever I have a chance to sniff Rhinoceros, I now feel brave enough to try it. tiffanie: rhinos do rely heavily on scent to identify each other and things around them…they do not have great eyesight, esp. from far away. Hope you can sniff Rhinoceros! These were my thoughts exactly. Thank you for bringing this woman and her legacy to our attention Kevin. Great review, Kevin! It’s amazing the friendships humans sometimes form with other species. FYI, as a result of your review, I picked up a partial mini of vintage Patou pour Homme, which I’m enjoying this afternoon. Too masculine for me to wear, but I look forward to visiting it occasionally in fall and winter. Noz: that’s a beautiful one! What a wonderful story. I will look for that book. And find the sample of Rhinoceros that a NSTer sent me. Haven’t tried it just but will soon! Lizzie: try it while you’re reading the book. HA! Kevin, thank you for sharing some of Anna Merz’s inspiring life with us. The story of her reunion with the rhino was very touching. Hope you’re having a wonderful summer! Laura: I am, thank you…but it is going by so fast!! What a great way to commence a review – I was hooked by that thoughtful quote. More thanks from me for bringing Anna Merz, her autobiography and the perfume to my/our attention. I love Rhinoceros. It’s said to be very masculine but I think it can smell great on a woman too. As a very dry smoky/boozy/ leathery fragrance, it works well in very high temperatures too – I don’t find it suffocating, it just conjures up images of a majestic rhino charging across the savanna in shimmering heat. Beautiful! The book sounds fascinating; I shall seek it out. 2rista…agree, women can wear this, and it isn’t overpowering. Love the love with the Rhinos… and the funny stories. Glad you like the perfume too. Thanks for your wonderful review/article. It was really nice to learn of this woman Anna Merz, and her work. I tested all of the Zoologist samples and I think that Rhinoceros is my second favorite in the line after Elephant. I tried to offer Rhinoceros to my husband, but he found it to heavy unfortunately. V: I can’t wait to try Elephant…hope I can smell the sandalwood they used.